Features split-screen with multi-monitor support (one monitor per player). 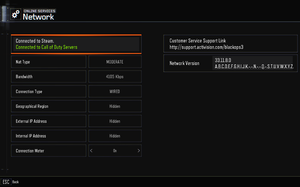 Official modding tools and unranked dedicated servers available. By default, some settings are restricted depending on graphics card, but a fix is available here. There may be some performance issues, but a fix is available here. 8.4 The game causes the hang of the entire system and the computer itself completely before rebooting. The Zombies Deluxe Edition contains the base game, the Season Pass, The Giant Zombies Map, Zombies Chronicles and 3 Personalization Packs. Call of Duty: Black Ops III - Multiplayer Starter Pack is a multiplayer-only version of the game that has limited content. Originally a pre-order bonus, later made free. All of the following tweaks are applicable also for Black Ops 4, and they may have similar names. This is due to the fact that in both games a relatively identical engine is used and it has been modified further for this game. You can also delete other videos to reduce the waiting time between level changes. Find the line MaxFPS and set the value to 0. Changing this option disables FPS limiting altogether, which increases the loading speed of the levels and also allows you to get a little more FPS than it was even at 1000. This also applies to other games, changing similar options also improves the speed of work, for example in CSGO. Find the line FullScreenMode and set the value to 2. 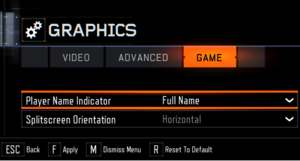 You can also change this option in game on graphics settings. This will significantly increase the FPS and also stabilizes the smoothness of the gameplay. And also accelerate switch between windows, including a combination of keys such as atl + tab. Many graphics cards are able to handle high graphical settings, but by default the game hides/restricts some settings. Open config.ini with your file editor of choice. Find the line RestrictGraphicsOptions and edit the value from 1 to 0. If the game is installed in the default folder then you might need to run your file editor of choice as an administrator, or copy your config file to your desktop, make changes and replace original file. HUD and menu is stretched. 65-120° with 80º as default value. FXAA, SMAA (1x and Temporal 2x), Filmic SMAA (1x and Temporal 2x), and SSAA through Render Resolution option. 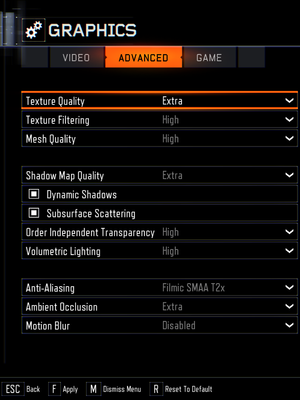 SMAA T2X and Filmic SMAA options are disabled for SLI/Crossfire systems. Double buffered. See here for triple buffering. 240 FPS max in Multiplayer using in-game menu, unlimited by changing com_maxfps value to 0 in the config file or with in-game console while using any mod. Unlimited in Zombies and Single Player. Find the line BackbufferCount and edit the value from 2 to 3. Natively supports both the Xbox One and the DualShock 4 controller without any 3rd party tools required. Master, Voice, Music, SFX Volume. 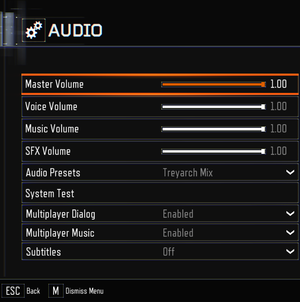 Subtitles option is available only when using English audio. Lacks Latin American translation (available on console version). Only Castillan traduction is available. The game does not take advantage off the entire VRAM amount available. Find the line VideoMemory and edit the value from 0.75 or 0.90 to 1. Also check the parameter StreamMinResident and change its value if required from 1 to 0. This setting helps to reduce the frequency of accessing the main RAM and allows the game to use all the video memory. It also reduces the frame time and increases the smoothness of the gameplay with a decrease in control response time. On some configurations, these options can have a negative effect on performance, and in this case it's worthwhile to specify these values in the reverse order. This is due to the fact that these parameters also affect the drawing distance. Find the line SmoothFramerate and set the value to 0 from 1. This setting helps to prevent a strong drop in frame rates at certain points and also increases the smoothness of the gameplay. Use Triple Buffering and Prepared frames. Find the line MaxFrameLatency and set the value to 4 or 0. And use D3DOverrider to force triple buffering on. This greatly increases the smoothness and also greatly prevents a drop in the frame rate. Usually the use of triple buffering only works with vertical sync enabled. But instead of using vertical synchronization, you can use FastSync in the settings of the NVidia video card driver, as well as turn off vertical synchronization in the settings of the game itself. A similar option for amd owners is called as Enhanced Sync. This mode will not limit the FPS, but also allows you to activate triple buffering. The use of a larger number of prepared frames and the use of a triple buffer may increase input lags. Also, the Game may unevenly load the processor on some configurations. Find the line SerializeRender and edit the value from 0 to 2. Perhaps this will cause a slight decrease in FPS, but will make it a stable and reduce the time frame, as will improve the responsiveness of management in general. 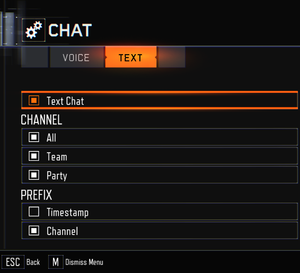 Start up the game and open the menu, select OPTIONS and after select CHAT that has a headset icon. 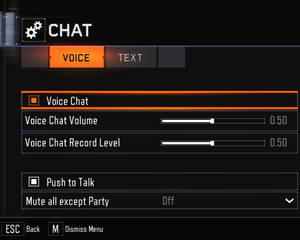 Change Voice Chat Record Level to your preferred microphone gain. If you have either AVG or AVAST, they are known to cause the game to crash. For better result, need uninstall antivirus and disable built-in Windows Defender. The game causes the hang of the entire system and the computer itself completely before rebooting. Right Click Computer -> Choose Properties. Performance Tab -> Click Settings. Advanced Settings Tab -> Virtual Memory -> Click Change. Uncheck Automaticaly manage page file. Clicking on disk will allow you to set paging file on any disk, except system. Save you changes and reboot Windows. In fact, this problem is mainly related to the use of a cheap and low-quality SSD disk based on the type of TLC memory or hard disk with errors. ↑ 2.0 2.1 File/folder structure within this directory reflects the path(s) listed for Windows and/or Steam game data (use Wine regedit to access Windows registry paths). Games with Steam Cloud support may store data in ~/.steam/steam/userdata/<user-id>/311210/ in addition to or instead of this directory. The app ID (311210) may differ in some cases. Treat backslashes as forward slashes. See the glossary page for details. ↑ Sethos88 commented on Any way to get rid of the opening video? 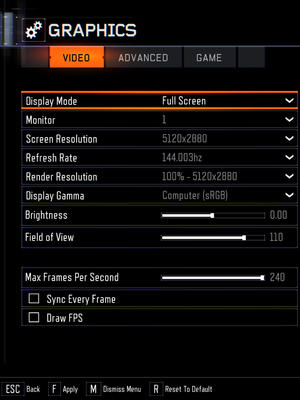 ↑ pcdev on Twitter: BlackOps3 PC FOV range is 65-120; default 80. ↑ pcdev on Twitter: @thebadbadrobot Up to 200 in ranked mp, unlimited everywhere else. ↑ pcdev on Twitter: BlackOps3 PC will use 100% dedicated servers for all ranked matches. 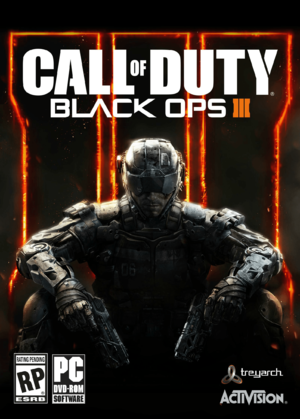 (Same as previous BlackOps PC titles.) This is how we do it.